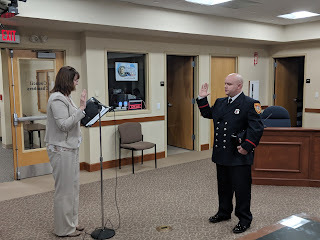 The town Council meeting on Wednesday, March 28 opened with the swearing in of Firefighter Paramedic Peter Ballou. Peter was introduced by Chief Gary McCarragher and sworn in by Town Clerk Teresa Burr. Councilor Mercer was participating remotely so all votes were via roll call. There was some discussion on the measure moving through the State legislative process to establish an animal registry before taking some action to endorse it. The measure was discussed and commented on. Any action to endorse it would be scheduled for future session. The only vote of significance was to approve a measure to upgrade the town's phone system with a new one via a lease arrangement which would provide a good savings over a purchase. The official Action Taken document as published by the Town of Franklin.